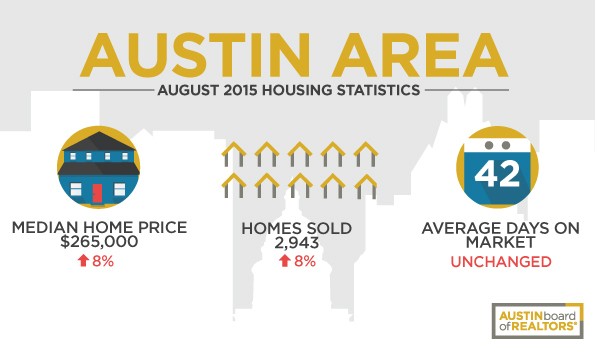 The median price for Austin-area homes jumped eight percent from August, 2014. In five years time, the median home price has increased 30 percent, or $65,000. Total volume sold was slightly under the $1 billion level (records set the previous two months), at $970,071,660, a 15 percent year-over-year increase. This demonstrates the staggering equity real estate can create. Homes sold increased eight perfect from the same period last year, while days on market remained unchanged at 42. Median lease payments in the Austin area increased seven percent in 12 months to $1,600.